If you have purchased eggs from a retailer recently, then you know that the most expensive eggs for sale are the ones known as “cage-free” or “free-range.” Why should these eggs have a higher value than the average commercial eggs? Part of the reason for this higher value is because these eggs cost more money to produce; however, they are better, healthier eggs all the way around. They have a higher nutritional value and the hens themselves are healthier than the caged birds kept under artificial light and fed a steady commercial diet. True free-range chickens are those that range outdoors on pasture. Meaning they do what all chickens do naturally: eat bugs, greens, and whatever leftovers they can scrounge or scratch up. The challenge for the homesteader, however, comes in the form of keeping and managing a flock of free-range chickens in order to reap the benefit of their eggs. Besides the obvious nutritional benefits, free-range eggs simply taste better! The most likely cause of the differences between free-range eggs and those from caged, commercial-production hens is the diet the hens consume every day. Basically, you are what you eat. After all, the free-range chicken’s diet is all natural and varied, while the caged hen eats only what is placed in front of her. Free-range hens are also usually healthier than their cousins kept in crowded cages in commercial poultry houses. The feeds given to commercial hens are the cheapest possible mixture of corn, soy, and/or cottonseed meals, with many types of additives mixed in. These additives often include growth hormones, meat and bone meals, as well as antibiotics and chemicals, like arsenic, to keep the chickens awake longer and producing more. The commercial chicken has a much shorter lifespan due to stress, illness and general disease than does a free-range hen—unless, of course, the free-range hen falls prey to a natural predator. This brings us to the how of raising free-range chickens on a homestead. There are a couple of options available to the homesteader for keeping free-range hens away from common predators that can often quickly decimate an entire flock. On our homestead, we have a large Anatolian/Pyrenees dog that lives with the chickens and helps to keep the predators at bay. Be warned, however—if you chose to keep a dog as a guardian for chickens, it takes a considerable amount of time to train that dog not to be a chicken predator themselves. Training a guardian dog for chickens can often unwittingly mirror the effort of training a retriever, especially when you return to the homestead one evening to see your favorite hen hanging between the wet, slobbery jaws of your security-guard-in-training. Our homestead allows the chickens a basically no-holds-barred lifestyle. They do not have a coop, per se, rather, they have a special roosting section in the barn. Our hens come in at dusk and roost in the barn next to the goat pens. We installed nest boxes in this same area for the hens to lay in, although they do not always cooperate. They like the hay bales in the barn as an alternative area for laying, and we have been known to have to do the occasional egg-hunt out in the woods. We started our flock by purchasing young chicks and putting them in heated stock tanks; eventually moving the chicks to small cages as they got older and no longer needed the heat. Then, when they reached a large enough size, we placed the cages out in the barn below the chicken roosts, next to the nest boxes. They lived there for 3-4 weeks, while we fed, watered, and cared for them. After we were certain that they recognized this area as their home, we let them loose with the older hens. This training ensures that they return to this spot every evening, thus protecting them from predators that would have an easier time catching them outside in the dark than during the daylight hours with their security guard nearby. We also have three roosters with our approximately 50 hens. Roosters look out for the hens, and each rooster has his own group of hens that accompany him out and about the homestead. The roosters watch the sky for hawks, owls, and other predators that they recognize as dangerous. These practices have worked well for us thus far, however, there are other means of keeping free-range chickens than the methods that we use. Another option the homesteader has is to use portable chicken coops and runs. Many homesteaders wish to keep free-range chickens but lack a barn and/or security dog. 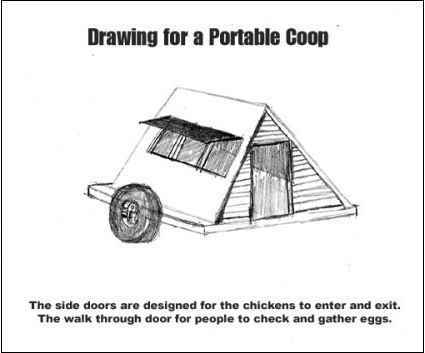 An alternative for these homesteaders is the portable coop. Portable coops can move about the homestead allowing a wider range-area for the hens. If the portable coop is the security point for them, the hens will return each evening to be locked safely away at night. If your homestead is still too dangerous to let hens runs loose during the daylight, don’t give up—a modified free-range is still an option. Not only can a coop be portable, but a run or pen area can be, as well. Portable fencing options are available to a homesteader with a little effort, providing a modified free-range approach. Chicken-wire and plastic fencing have made this alternative a quick fix for many homesteaders. A small fenced area made with one of the aforementioned fences and small, hand-placed electric-fence rods works well to rotate around the range every few days. This option not only helps to protect the chickens from predators, but also helps to work and fertilize the ground for future growing spots that an organically focused homesteader might choose to use at later date. No matter which type of predator protection you choose for your homestead, proper care and maintenance are still very important for your chicken’s health and egg production. Chickens require water and need a source readily available while afield. A natural creek or stream in the area is great, but if that is not available then you will need to keep shallow pans around the grazing area as a fresh source of water. Depending on the weather and winter environment on your homestead, your chickens might need some type of feed supplementation in the winter months. The best option for this would be some type of plain corn; chicken scratch is usually more expensive than chopped corn and often contains additives that simple chopped corn does not. If feed supplementation is necessary, then try to spread it out around the chickens’ range-area so that they don’t get accustomed to the idea of just staying around the coop for a free handout. Be warned, however, that once they get used to you feeding them, they will stalk you hoping for a free handout! If you are just now thinking about how to start egg production with free-range chickens, the most important step is planning what breed of hens to purchase. We always start with young chicks—either ones that we raise ourselves or ordered from a hatchery. When choosing chickens, it is best to choose a hardy breed type. Bantams and the fancy, decorative breeds of chickens are better suited for cages and shows than they are for production and life on the range. Darker-feathered chickens are also a better choice than your standard commercial laying white chickens. White chickens tend to be a walking buffet for every hawk, owl, and other predators in the vicinity due to their highly visible nature. Usually, the best choices for free-range hens are Rhode Island and New Hampshire Reds, Barred Rocks, Black Giants, and Australorps. These breeds are large and resilient, are usually very good egg producers, and are well suited to the free-range lifestyle. If you are ordering chicks from a hatchery, there are a few other bits of information that you will need to know. First, if you purchase straight-run chicks be advised that most of these chicks are cockerels (young roosters). Therefore, if you want mainly hens it would be wiser to purchase pullets and then purchase only a small number of young cockerels. Too many roosters lead to miserable hens and a lot of chicken-fights. However, if you would like to raise butcher chickens as well as egg production hens, then the straight-run order might be a better deal for you. Free-range chickens have lean, firm meat compared to the soft, mushy kind that is usually commercially produced. The next thing you need to keep in mind when ordering chicks is the equipment you will need to grow them into producing chickens. Young chicks need to be kept in a brooder-type environment until they are old enough not to need extra heat and special attention. A cheap practical way to make your own brooder is a child’s plastic wading pool with two-foot tall chicken-wire around the edges and a heat lamp hung about two feet over the middle of the pool. Fill the pool with wood shavings, or your preferred litter type, and place at least two feed and water dishes in for the chicks. It is best to feed the young chicks with a commercial chick-starter feed purchased at local feed store. This feed is best for young chicks because it is a finely ground, gently medicated grain that will prevent the all-too-common diseases in young chicks. As the chicks grow, you can change the starter feed over to the corn feed previously mentioned and eventually begin to transition them to free-range. Transitioning chickens from the cage to free-range will take about one week. This is important, so that chickens on-the-loose will know where their home is so they will lay in that vicinity (rather than out in the wild—or the garage) and come back to that location to roost at night. 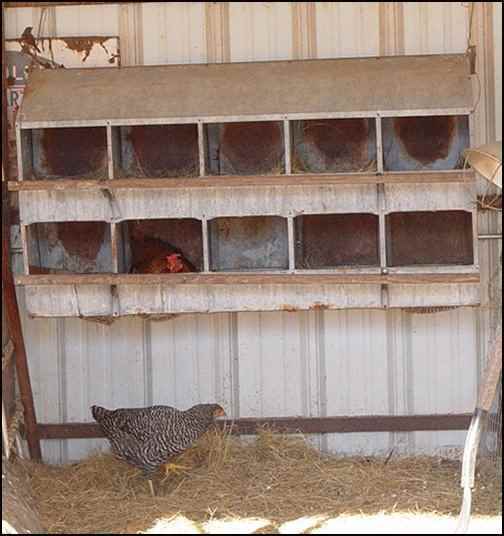 This is accomplished by keeping your chickens caged in or near the place you will want them to roost. You will need to feed and water them in the cages for approximately a week before turning them out. Also, if you are planning to use a guardian dog, make sure that they are kept close to the chicks from the very beginning. This way, they are more accustomed to their personal charges and less likely to see them as meals on legs—helping to avoid that hen-in-mouth scenario. By now you should not only have a good understanding of the benefits of free-range chickens, but also a fair grasp of how to proceed setting up your own equipment for them. You will also find your free-range chickens to be a wonderful source of entertainment on warm summer days. A single insect can cause mass hysteria among a flock of free-range chickens. Where one goes, they all go at a run and a massive chase scene can ensue over one juicy bug. They can also perform amazing duck and cover routines if something so much as an airplane shadow should appear overhead. You will learn just what a free-range chicken will eat, and you will also become adept at construction of chicken barricades to protect everything that you don’t want them to destroy—such as your garden—while they are in one of their feeding-frenzies. Free-range chickens are definitely worth the effort needed to take care of them, as the fresh eggs and meat are by far the best that you can obtain anywhere. There is also the satisfaction in knowing that you raised and cared for it all on your own—not counting the entertainment value as you learn just where the nickname “birdbrain” came from!